Due to space constraints, we need to clear out our Grande Route frames. Regular price for frame and fork was $1300. On sale for $900.00 This price is only for in stock frames. As of April, 2014 we have small and medium in stock. 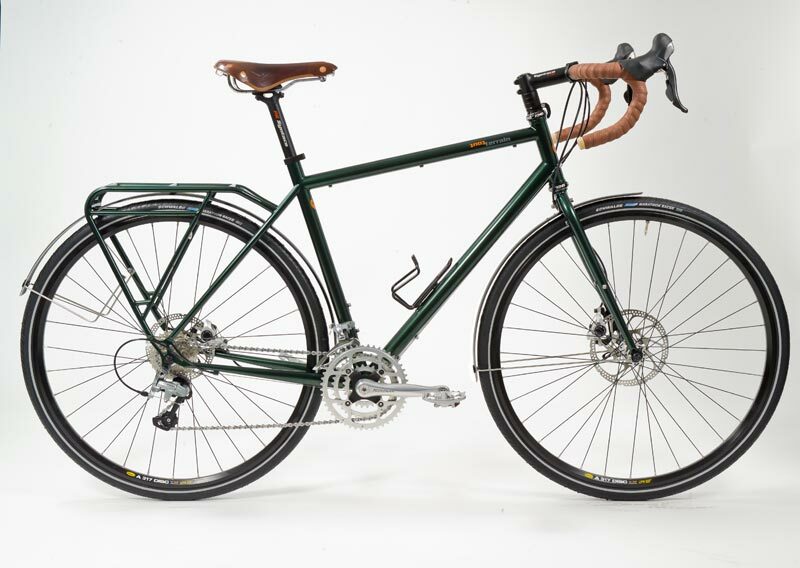 If you ride brevets, you know how difficult it is to find a bike with lively performance, space for large, comfortable tires, fenders, and set up to work with a dynamo lighting system. And of course nobody makes such a bike with extremely efficient and reliable disc brakes, right? Not until now. The Tout Terrain Grande Route has space for 700x35mm tires with plenty of fender clearance. Think of a racing bike but without all the annoyances like no tire and fender clearance, no way to mount a rear rack and lights. 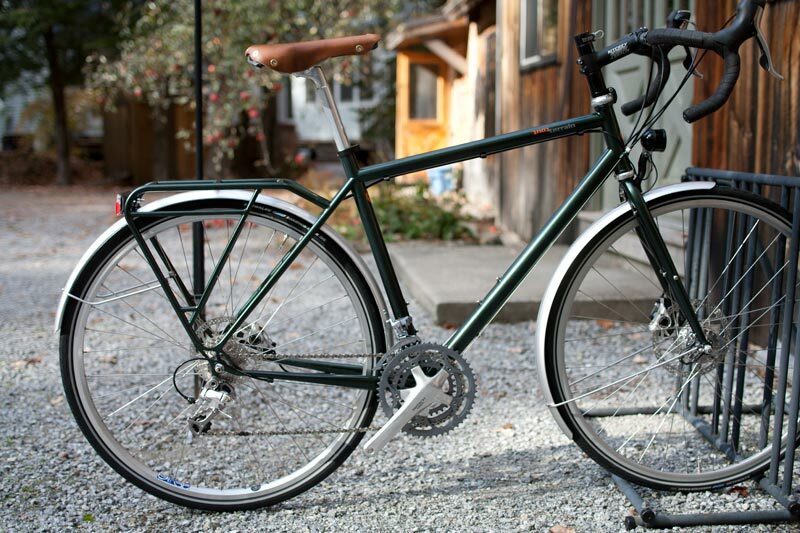 The Grande Route has a rear rack, built into the frame, just like a Silkroad. It uses disc brakes, drop bars, any type of shift levers, STI, Ergo, bar end or downtube, either a triple crank or a double, front and rear light mounts, attachment points for light wiring, dynamo hub of your choice, many gearing, crank length, saddle, headset and bottom bracket options. You decide. It's going to be your bike, you'll be riding it a very long way, so why shouldn't you have it just the way you like? The Grande Route frame is now in stock. Here's a photo of our demo bike, a size medium with Ultegra drive train. The demo model has the steerer tube left extra long to make it easy to adjust the handlebar to most any height. 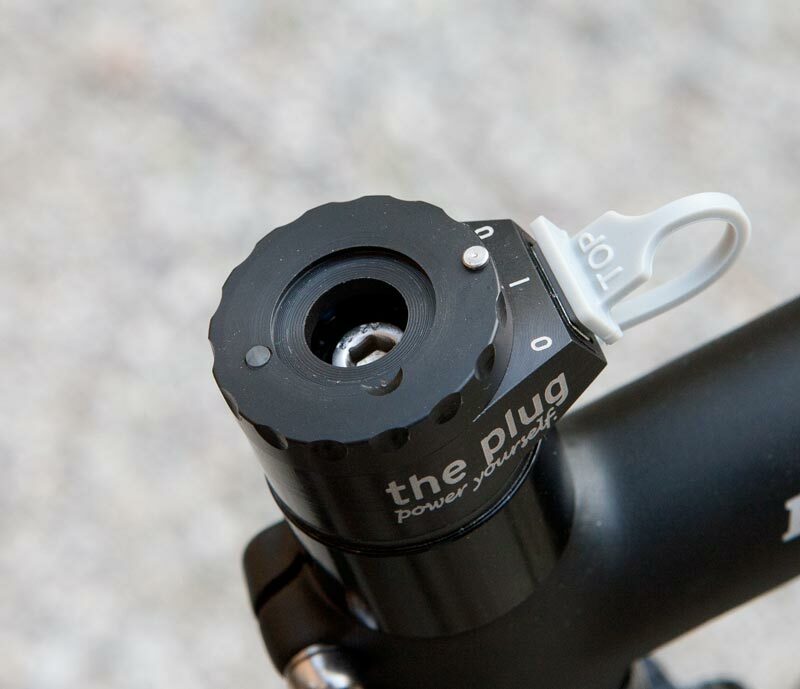 It's even equipped with "The Plug" so you can try that out with your iPhone. If you come by some evening (make an appointment!) you can see how well dynamo lights work. After making this image, I installed Shimano A530 SPD pedals and weighed the bike. It's 29 pounds, 5 ounces. Not bad for a bike with rear rack, fenders, disc brakes and lights. 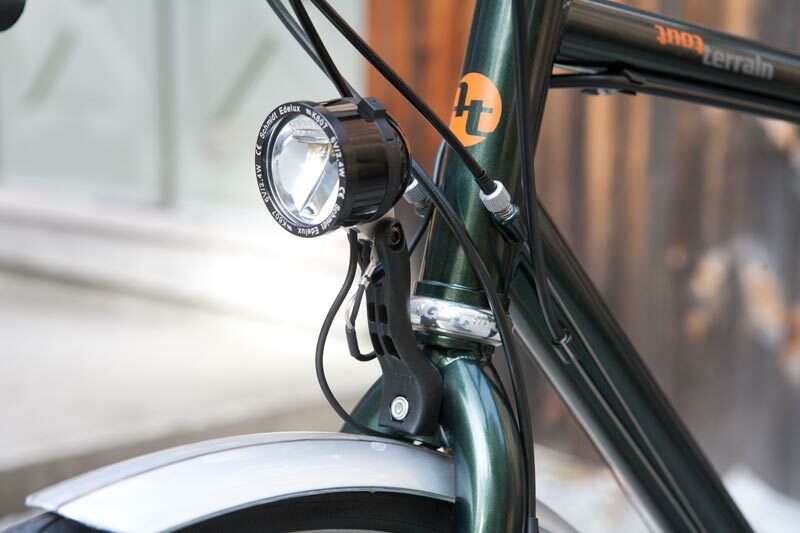 Here's a Schmidt Edelux headlight mounted on the Grande Route fork on a Busch & Müller headlight mount. 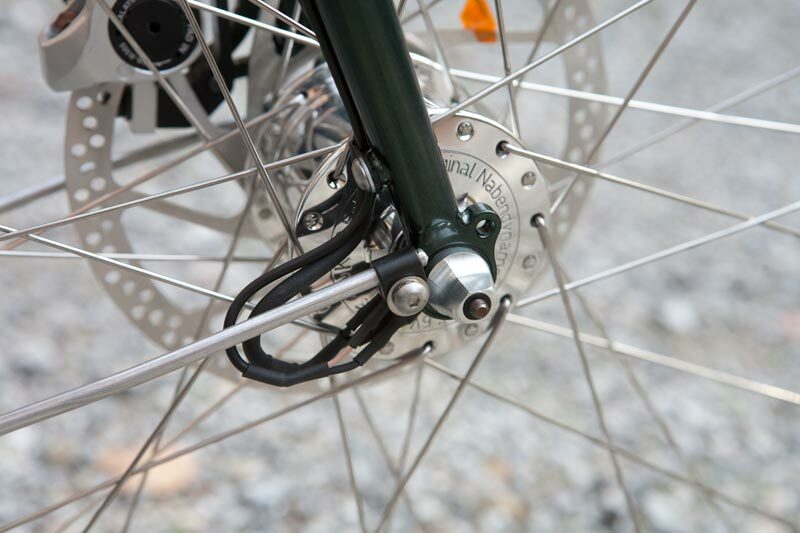 The Grande Route fork has three threaded eyelets down the right fork blade. Here you see the wiring for both the headlight and The Plug, which is installed inside the steerer tube. And as will other Tout Terrain frames, provision is made for attaching a taillight wire and routing it through the rear rack. These tires are 700x35 Schwalbe Marathon Racers. The fenders are Berthoud composite, 700x50. Here's the switch for The Plug, minus its top cover. You can see the allen bolt which holds the switch in place, just like the top cap of any threadless headset. The USB cable plugs into the front. Here's the left rear dropout showing how the rack section connects, and the mount for an optional SKS kickstand. The rear disc is 160mm. Shown here with Shimano calipers. But I found that these extend out to the side a bit more than I'd like. So I'm now recommending the Avid BB7 Road calipers. I'll put up a new photo soon. Left front dropout. We use a 180mm disc in front. 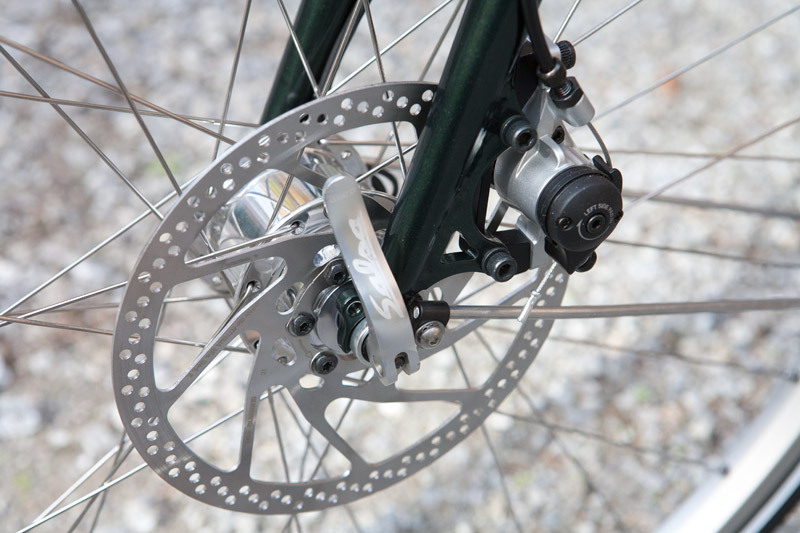 The larger front disc gives you more stopping power at the front than at the rear. Whatever amount of stopping power you can use at the front is always more than you can use at the rear, since weight shifts to the front wheel during braking. The SON28S dynamo hub takes ISO discs. Of course we also have the SONdelux disc hub, which takes Centerlock discs. 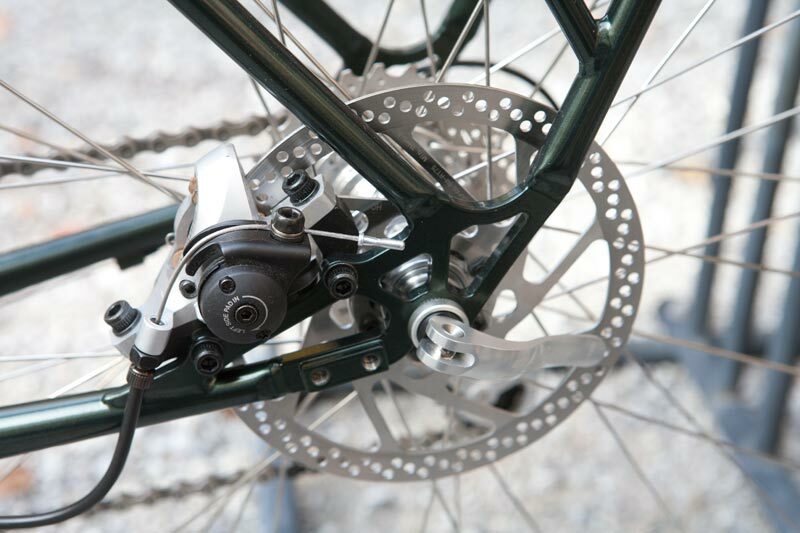 The dropouts open down and towards the front, so torque from the brake won't cause the hub to slide out of the dropout. Here's the right front dropout. The wiring for The Plug and the headlight attach to the dynamo hub, a Schmidt SON28S. And you can see the third or bottom threaded eyelet on the fork blade for routing the wires. I've used button head stainless steel bolts for attaching the fender struts. We also have cap screw which use a larger 4mm allen wrench, and hex head screws, that use an 8mm box end wrench. We'll assemble your bike the way you want it. The Grande Route is available as frame only, frame and fork, a bicycle kit, meaning built wheels and installed bottom bracket and headset and whatever parts you need, or as a complete built bike. And of course we have one here (medium size) for test riding. Four sizes; small, medium, large and extra large. The sloping top tube allows a wide range of people sizes to get a good fit with only four frame sizes. In the table below, all dimensions are in millimeters. For most other Tout Terrain products, please go to this page. 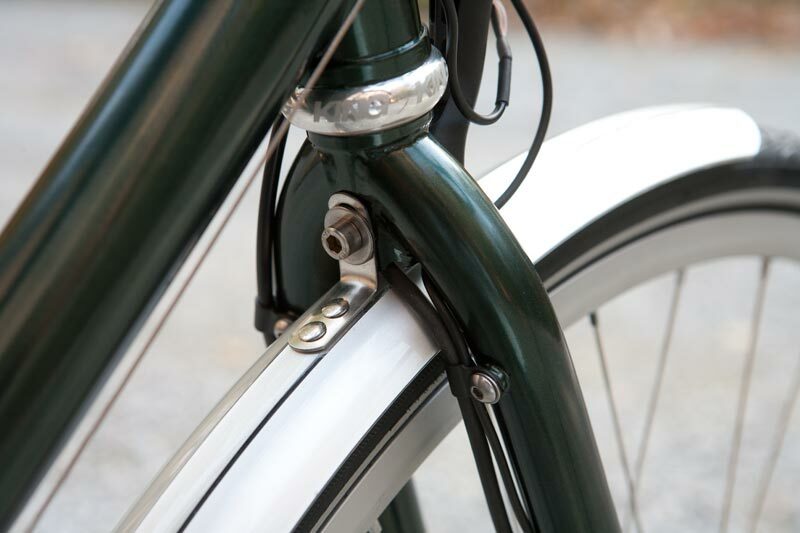 For the Tout Terrain Metropolitan, with Gates belt drive, please go to this page.